Along with his teammate, Curly Neal, Meadowlark Lemon and The Harlem Globetrotters have performed to audiences all over the world. 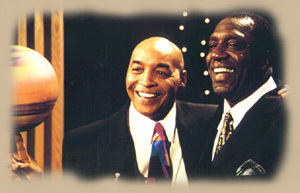 Meadowlark Lemon, is set to present the 2nd annual “Drive for Hope,” charity golf classic in Salem, Oregon. The kick off for the event is set to begin with a shot gun start at 1 p.m. on Monday, Aug. 22, Salem Golf Club, located at 2025 Golf Course Rd. S.
The fundraiser includes an award dinner and auction at 6 p.m., followed by a visiting session with Meadowlark Lemon at 7 p.m. Proceeds will benefit the Salvation Army in Marion and Polk counties. Golfers who would like to play a round of golf with the former Harlem Globetrotter can bid to do so. Registration to participate in the charity event is required by Aug. 15. Golfers can pledge their bid on the enrollment/registration form. To learn more, contact Tom Ferrin at (503) 798-4843 or by email to thomas.ferrin@usw.salvationarmy.org.